Factual error: Women's stockings had seams in 1944. When people are dancing at the party in Bayfield's apartment, the backs of women's legs appear in enough shots to show that their stockings, anachronistically, are seamless. Factual error: A 1950 Chevrolet and a 1950 Oldsmobile can be seen in street scenes in this supposedly 1944-set movie. 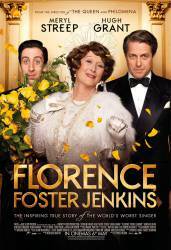 Florence Foster Jenkins: They're getting through the potato salad like gannets. St Clair Bayfield: No mockers and no scoffers. Question: Every time Florence would perform before a live audience, people would respond by either laughing at her or booing at her. With these kinds of reactions, how could Florence not realise that it was because nobody liked her singing and that they considered her a terrible singer? Answer: People believe what they want to believe and can have an uncanny ability to filter out anything negative or unwanted. Eventually, she realised the truth. Also, Florence's friends and supporters protected her and would do whatever they could at the concerts to suppress any audience member who reacted negatively.